First the obvious one: Our Not-a-Tax-Haven Ireland is in the company of Bermuda, Lux and Switzerland, alongside the equally Not-a-Tax-Haven Netherlands (that Double-Dutch Sandwich is an all-transparent arrangement to attract companies to Dutch quality workforce, only second to the best-in-class workforce of Ireland). That is trivial stuff, though. 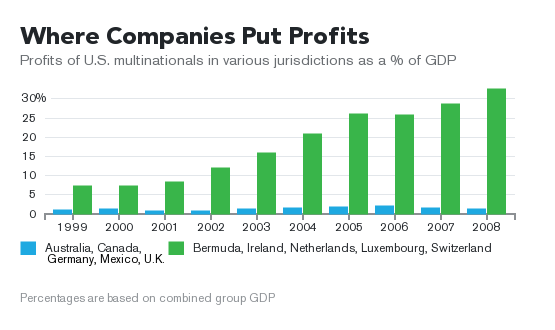 Second (less trivial) is the quantum of profits domiciled in the likes of Ireland. It has been large and rising. 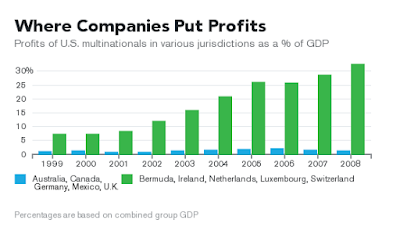 And thus, if begs a question: What happens to Irish 'economic growth' when these profits are repatriated either for investment purposes abroad (e.g. in Asia Pacific or elsewhere) or on foot of any future tax amnesty in the US or both? Answers to that question should be mailed to every Irish Minister so keen on confusing MNCs profits and Irish economic miracles.